Doctor Who Magazine have sent DWO the cover and details for Issue 496 of DWM. 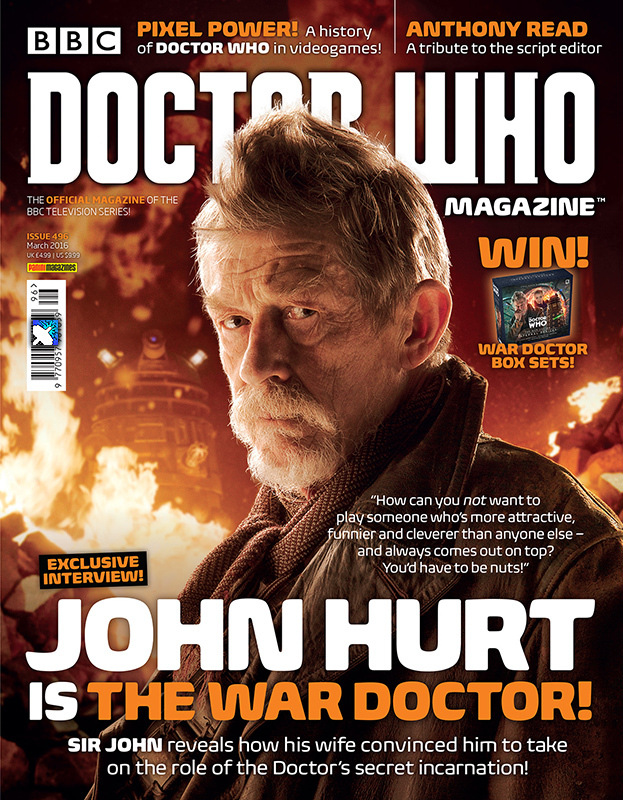 Doctor Who Magazine exclusively interviews Sir John Hurt, who played the mysterious incarnation of the Doctor in 2013's 50th Anniversary Special The Day of the Doctor – and asks him about his return in his brand new Doctor Who audio series! + Doctor Who Magazine Issue #496 is out on Today, priced £4.99. + Subscribe Worldwide to DWM from just £19.49 via Unique Magazines! Doctor Who Magazine - Issue #499 - Cover & DetailsDoctor Who Magazine have sent DWO the cover and details for Issue 499 of DWM.Doctor Who Magazine - Issue #509 - Cover & DetailsCover and details for Issue #509 of Doctor Who Magazine.Doctor Who Magazine: Issue #522 - Cover & DetailsDoctor Who Magazine have sent DWO the cover and details for Issue #522 of DWM.